Through perfecting a custom implementation of the native Bluetooth SBC codec, which we call Shift, we deliver a level of purity and sound that rivals and challenges the very best in wired headphones. A great feature of Shift is that it’s pair and play, meaning, nothing special is required on your phone or music device, just standard Bluetooth, Shift takes care of the rest. BlueBuds X is locked and loaded ready for anything you can dish out. Patented sports ear cushions hug into the top, back & lower surface areas of the ear, all essential to lock in for sports. 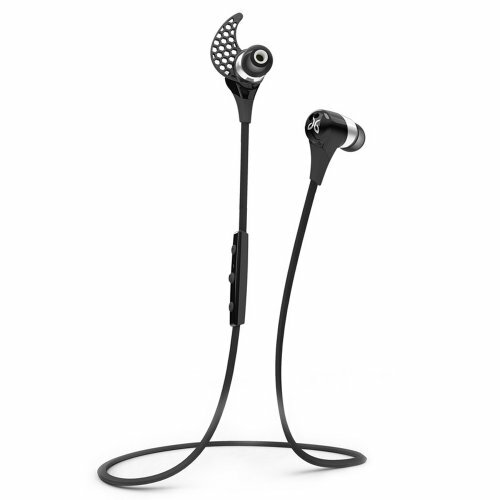 Jaybird offers the very best in secure fit for sports & fitness. BlueBuds X are simply the smallest Bluetooth headphones in the world, add in the remarkable playtime, the BlueBuds X are simply the most progressive Bluetooth headphones available. A stand out feature of BlueBuds X is the ability to lift the cord off your neck for a super liberating workout experience. Jaybird’s patent pending X-Fit allows for the headphones to be used either in the traditional under-ear wearing style for music & calls, or over-ear, designed for those wanting a great sports music experience, free of anything on your neck. At Jaybird, we’re athletes with a passion. A passion for getting products right. We include a Lifetime Warranty Against Sweat across all Jaybird products. To further enhance our Lifetime Warranty Against Sweat, BlueBuds X feature Liquipel Sweat Repellant Nano Technology. A super hydrophobic process that provides the BlueBuds X with added protection from exposure to sweat and the elements. Use your music device left/right side, above/below waist, it doesn’t matter with SignalPlus. Considerable innovation has gone into SignalPlus, the ability to run and play sports outdoors while using your music device anywhere on your body without the traditional limitations of your body getting between the devices and blocking signal. Even put your phone/music device in a bag at the gym and workout at a good distance without signal droppage. We’re confident you’ll be impressed.